« From $199,900! Handcrafted West Coquitlam Regan’s Walk Condos by Marcon > 71 Homes with 1 – 3 Bedroom Floor Plans in Burquitlam! Contemporary charm meets natural beauty! Alder Vista Richmond’s 35 unit townhouse project is the ultimate of quality workmanship. Your personal oasis, surrounded by greenspace and a panoramic view, the homes at Richmond Alder Vista townhouses range from a spacious 1,158 to 1,300 square feet in size and are available in 3 bedroom and 2.5 bathroom configurations. Each boutique Richmond Alder Vista townhome features unique 3 level living space with secure two car garage parking. Enjoy the extraordinary accessibility of central Richmond McLennan North neighbourhood, making Alder Vista Townhouses one of Richmond’s most desirable locations. Mere minutes away from the shopping and dining convenience of Richmond Centre, these homes are surprisingly affordable to own, so don’t settle for anything else! 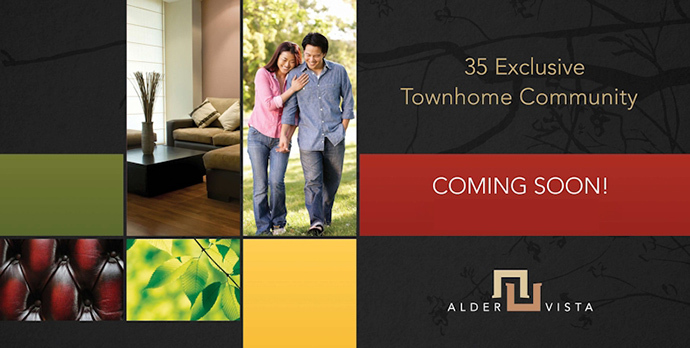 The presale Richmond townhouses at Alder Vista are priced affordably from just $566,000! The grand opening is happening late September 2013 and the presentation centre is at 6333 Alder Street Richmond. The sales office is open 12 to 5pm every day except Friday. Visit www.aldervista.com today to preregister and learn more about this amazing project. Located in the promising McLennan North Richmond neighbourhood, Alder Vista townhomes features 3 bedroom floor pans with 3 levels. Close to the Canada Line SkyTrain, the homes are within reach of the YVR airport, downtown Vancouver and everywhere else in the Lower Mainland within minutes! Nearby is Garden City Park, lots of shopping and dining as well as entertainment options. In addition, the Alder Vista Richmond townhomes are also very close to outdoor recreational options as well as hiking and biking trails, tennis courts and other facilities. There are only 35 homes for sale! The townhome floor plans range in size between 1248 to 1488 square feet. Yamamoto Architecture Inc along with Takahiro Holdings Inc developer have created some of the most versatile and functional layouts ever seen in this neighbourhood. The luxurious 3 bedroom and 3 bathroom Alder Vista Richmond townhomes will include 2 car garages, stainless steel appliances, hardwood floors, pre wiring for security alarm system and a modern contemporary exterior design. The finishing package is also luxurious. Together with its unbeatable McLennan North Richmond location, spacious floor plans and large outdoor entertainment space, these affordable townhouses will be a great option for couples, families and retirees. The homes are situated along Alder Street Richmond McLennan North (between Hemlock Drive and Alberta Road). There are four main layouts available at this boutique Richmond townhouse project starting with Floorplan A which is between 1295 to 1300 square feet. It has 3 bedrooms up top along with 2 full bathrooms on the top level. The main level is an open concept flow through of living, wall kitchen with island and dining plus a powder room. The ground level has a 2 car garage plus extra storage space. Floor Plan B at Alder Vista Richmond features 1245 to 1278 square feet over 3 levels again. However, the configuration of the top level with 3 bedrooms and 2 full bathrooms is slightly different as the bathrooms are back-to-back. The second floor has a living and dining room open area with an L-shaped kitchen to one side plus a powder room. Floorplan C is between 1263 to 1270 square feet and it too, has 3 bedrooms and 2.5 baths. It’s more similar to B than to A. The smallest of the floor plans at Richmond Alder Vista townhomes is D Plan which is between 1158 to 1175 square feet and the floorplate takes a ‘squarish’ shape to it. The ground level has the 2 car garage whilst the second floor has a U shaped kitchen and open living/dining space plus a powder room. The third floor again has the bedrooms and two full bathrooms.